I am not a mystic, but I have a great love for the goddess Ariadne. Because I am not a mystic, I don’t know her in that sense, but she and her story have great meaning for me nonetheless. Ariadne’s best-known myth, that of her role in the victory of Theseus over the Minotaur and subsequent abandonment by Theseus, her rescue by and marriage to the god Dionysos and her eventual apotheosis into godhood, survives in several different forms; the details vary, but the essence of the story is simple and yet not simple. Ariadne has also a less well-documented cultic history in ancient Crete, where she may be associated with the Mistress of the Labyrinth. My personal UPG with regard to Ariadne is that she is strong and brave both in intellect and in emotion. Clever and wise, able to aid Theseus in his mission, and yet courageously full of feeling, willing to leave her home and status to follow her heart and the hero. I admire her strength, her wisdom and her open spirit, and that she expresses both head and heart with such might. 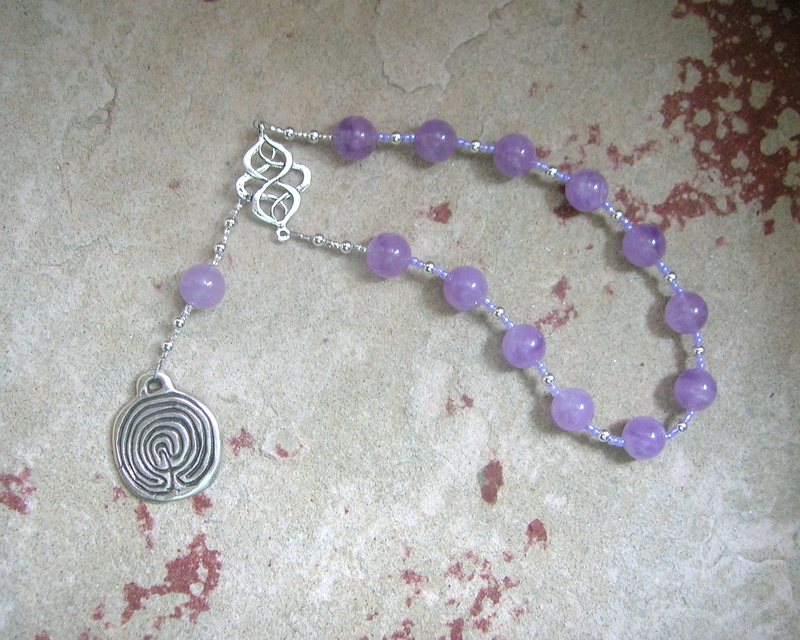 These Ariadne pocket prayer beads in milky amethyst are approximately 11″ in diameter (28cm). They come with a prayer to Ariadne, written specifically to be used with this prayer bead design and with a cotton muslin bag for storage. You can, of course, use the beads with any prayers, or for any god or gods, that you choose or that resonate with you. They are available here at my Etsy shop. 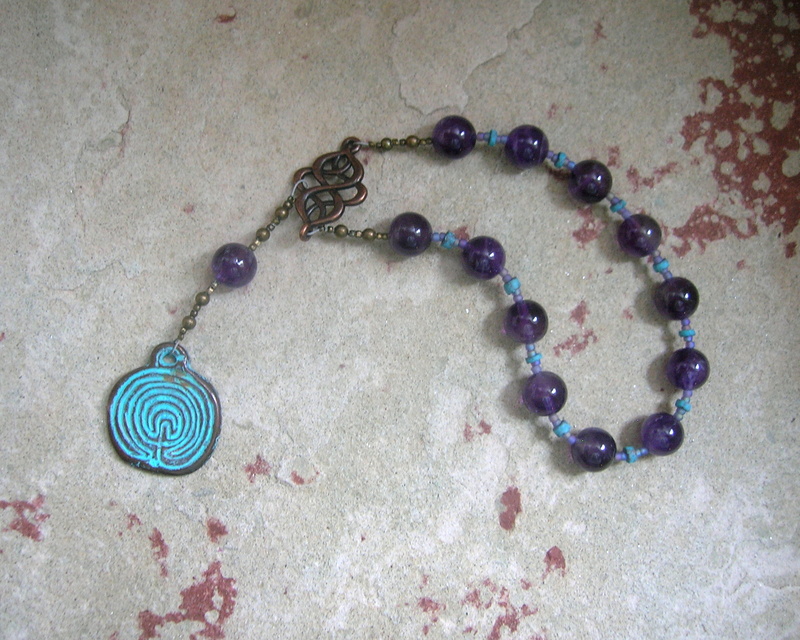 These Ariadne pocket prayer beads in a darker amethyst are approximately 11″ in diameter (28cm). They come with a prayer to Ariadne, written specifically to be used with this prayer bead design and with a cotton muslin bag for storage. You can, of course, use the beads with any prayers, or for any god or gods, that you choose or that resonate with you. They are available here at my Etsy shop.